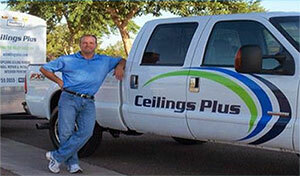 "Proudly Phoenix, Scottsdale, Glendale, Peoria and Surrounding Areas"
Ceilings Etc. in Phoenix, AZ. For over 30 years, residential homebuilders applied the “cottage cheese” like acoustic ceiling texture commonly referred to as popcorn. Many builders actually touted it as an upgrade and a way to reduce echoes. What it really did was cover up poor workmanship, i.e. poor drywall installation and the taping of seams on the ceiling. As these homes age, the “popcorn” ceilings take on a dull yellowish brown appearance. The reason for that appearance is “popcorn” is a porous surface that absorbs airborne pollutants that can only be eradicated by removal.